Scrabble started my addiction. Scrabble is a gateway to word games. When I was 8 my family was given a deluxe edition of Scrabble. The board had a plastic shell that you could fit each piece into. It was also on a lazy susan. My Brother was really into monopoly, Risk and Stratego. I couldn’t win at those games against him. When I did win it was always a scene. When we would play Scrabble as a family or with friends even if I lost it was a social happy time. I was also really good at Scrabble. 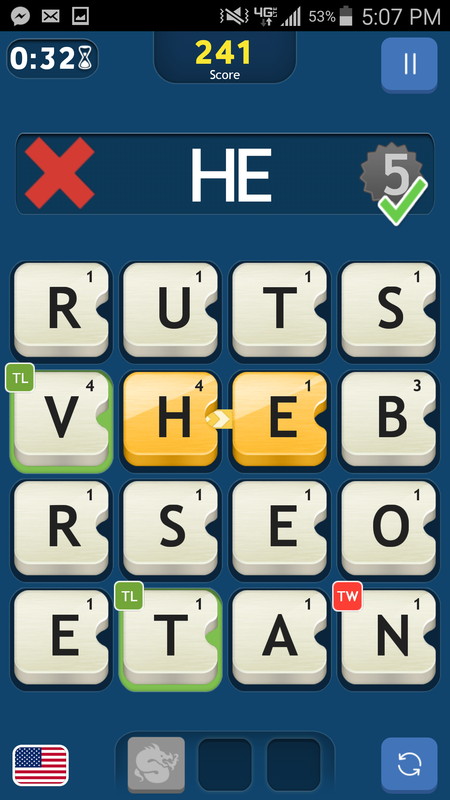 Word games were something I felt good at, even when I lost. The first I had that could download game was not a Samsung. It was some weird phone with a keyboard that could pull out. It wasn’t a flip phone, it was more advanced. (Read that and think about Invader Zim.) I didn’t want to run up our bill so for a long time I just played games on Facebook through my phone. This was when touch screen phones still needed major work. So that was… three years ago. 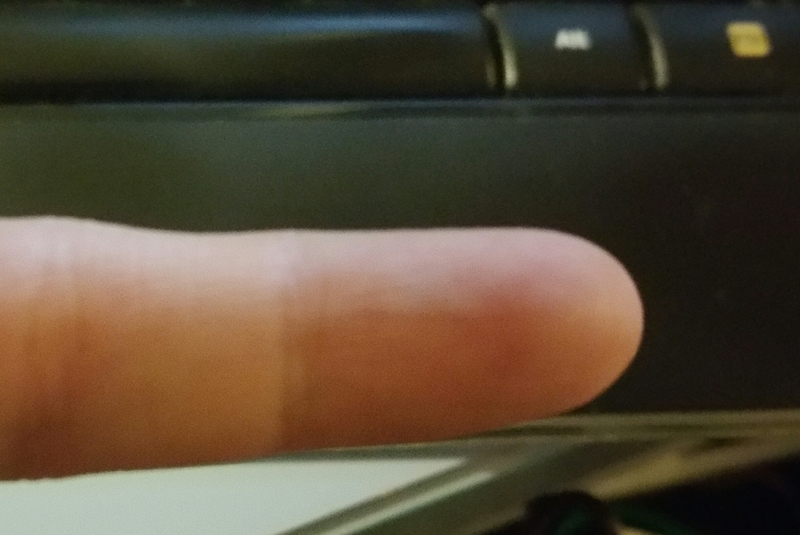 Now I have a super fancy phone and a notch on my left pinky from holding it up. 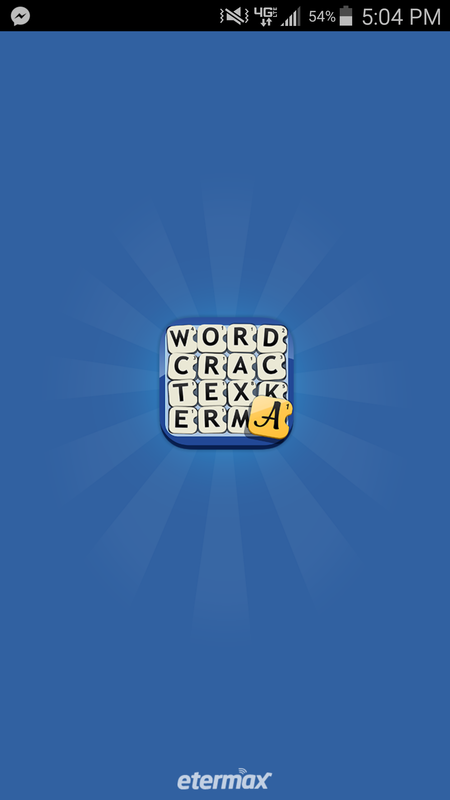 There are a bunch of great word games out there but the one that keeps me coming back is Word Crack. This game is appropriately named. I play it everywhere; bus, bathroom, train, practice, dinner, before bed, in bed, while waiting for Pathfinder to start, standing on the corner, hang out with my parents, etc. You get the picture. I’ve become the person constantly on the phone. I’m not doing anything interesting to others, just paying Word Crack. I have adapted so much I can have conversations while playing several rounds. Word Crack is electronic Boggle. You have two-minute to spell as many words as possible. There are three rounds for each player. Then the score is totaled from the three rounds. The winners get 3 coins. 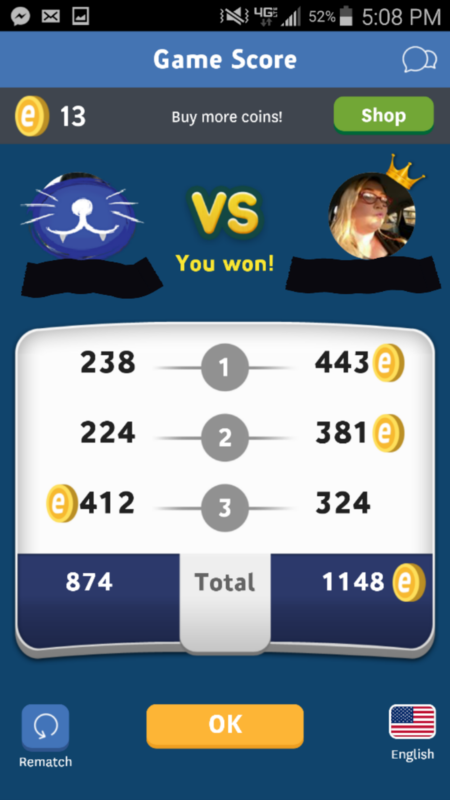 The game matches you with a random opponent or a friend. You get to choose which option you want. If you play against someone and you enjoyed it, you can invite them to another game. I’ve had some serial games with other players. There is strategy though. 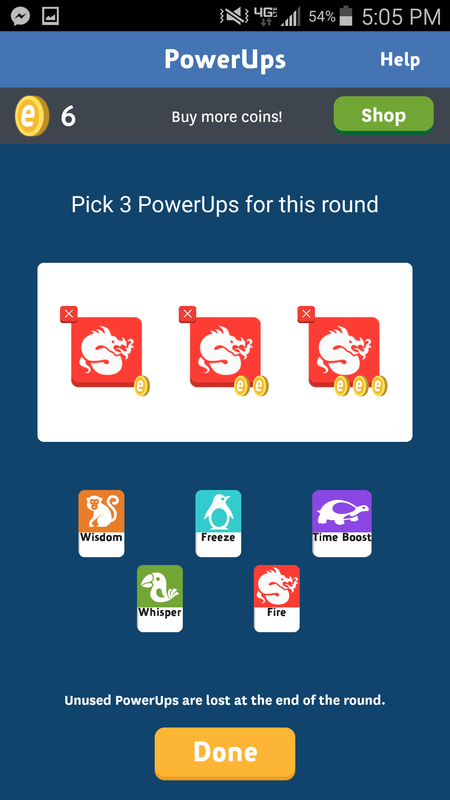 There are power ups you can choose before your match starts. By playing you earn coins so they do come back after a while. They let you but power ups to get an advantage. 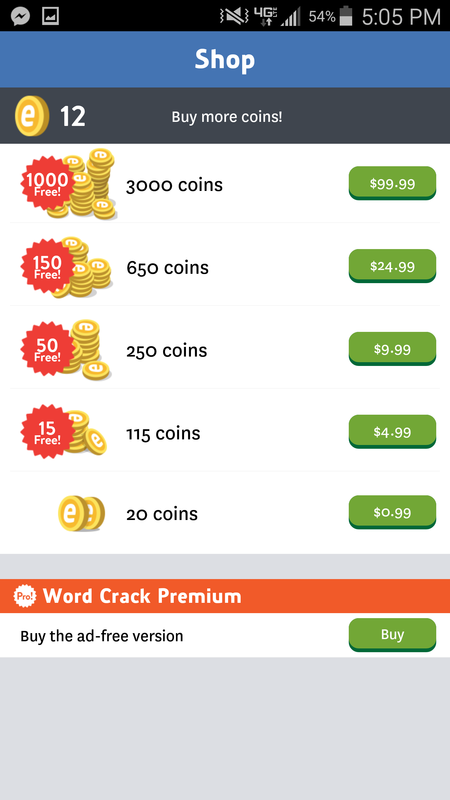 You can choose three at the start, if you have enough coin. Fire gives you double points for 30 seconds. Wisdom gives you the path for words that can be made. Freeze stops the clock for a 15 seconds. Time Boost adds more time by chosing a random letter. If you use that letter it adds time to the clock. The power lasts 30 seconds. Whisper tells you a word but doesn’t show you where it is on the board. I almost always use FIRE. I find fire is the most useful for me right at the start. You have to activate it yourself at any time during the round. If you don’t use it, you lose your power up. I’ve spelled some weird words. The longest word I’ve spelled is “Arriviste.” My best game score 1995. You can see all that information in your profile. When I first started playing I was methodical. 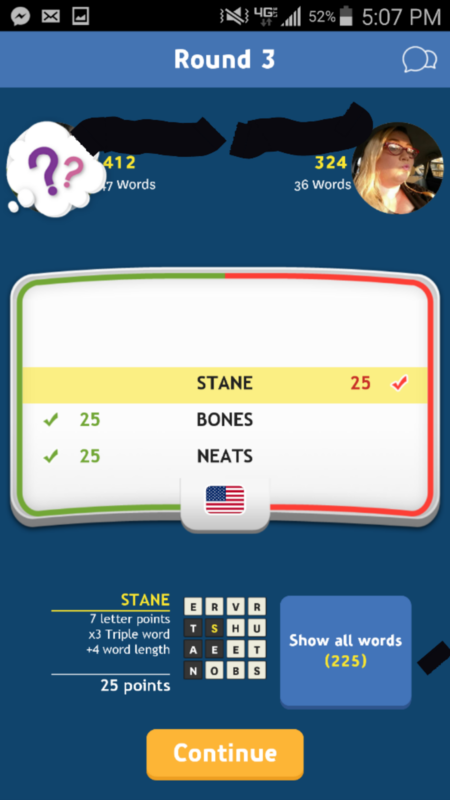 I would try different ways of just randomly swiping across the board to spell words. This was ineffectual. Eventually I figured out if I ignore the clock and turn the sound off, 2 minutes feels like forever. I do my best when I don’t care how much time I have left. Another cool feature is they have different languages and versions. If you are bilingual, try one of the other languages like Spanish or French. Sometimes late at night random opponents become far and few between so I switch to the British English. That’s always weird because they have a lot of slang in there that I’ve discovered. 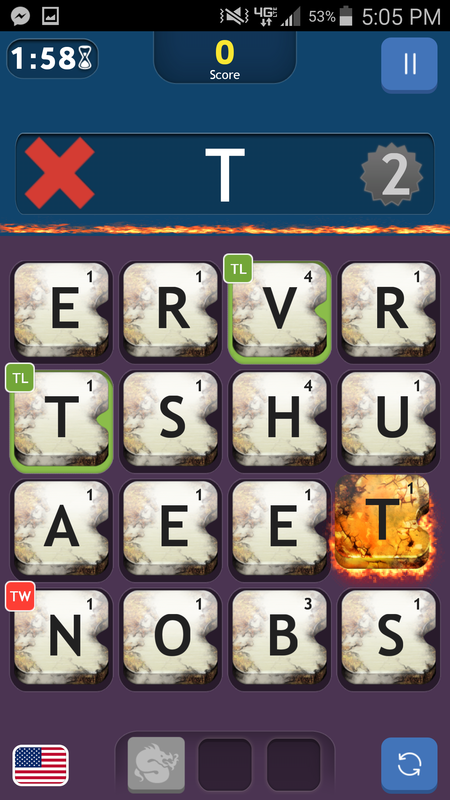 Also, if you’re having trouble look at the words your opponent spelled or change the orientation of the board. Sometimes just turning the letters a different way helps. Be careful though. This game can be very addictive. It will consume your life. You can find yourself buying coins and everything goes down hill from there.